Sessue Hayakawa and Tsuru Aoki star in this romantic tale of a mad, reclusive Japanese artist who believes that his love has been captured by a dragon. Discovered by a surveyor, he is brought to the attention of a famed painter who is looking for an apprentice, but whose daughter the young artist sees as his fantasy fiancée. She becomes the nexus of a clash of hopes, desires and wills between the old and young artists. The film was recovered in a French-language export print, and has been restored by the George Eastman Museum film archive. with The Wrath of the Gods (1914), color-toned black & white, 58 minutes, not rated, and Screen Snapshots, Issue No. 20 (1921), black & white, 5 minutes, not rated. MILE00108, UPC 7-84148-01084-7, ISBN 978-1-933920-078. One single-sided, dual-layered, Region 0 NTSC DVD disc, 1.33:1 aspect ratio image in windowboxed 4:3 (720 x 480 pixels) interlaced scan MPEG-2 format, ? Mbps average video bit rate, ? kbps audio bit rate, Dolby Digital 2.0 stereo sound, English language intertitles, no foreign language subtitles, chapter stops; standard DVD keepcase, $29.95. Release date: 18 March 2008. This DVD edition of a Hayakawa double-bill features The Dragon Painter transferred from the excellent 1988 35mm restoration by the George Eastman Museum film archive, coupled with their 35mm restoration of The Wrath of the Gods. The features are supplemented with a Hayakawa appearance in a novelty short, the original script for The Wrath of the Gods, a stills gallery, an essay by Brian Taves, and the text of the source novel, The Dragon Painter by Mary McNeil Fenollosa. The features are accompanied by music scores by Mark Izu and Marco Lienhard. This Region 0 NTSC DVD edition is also available directly from MILESTONE FILMS. 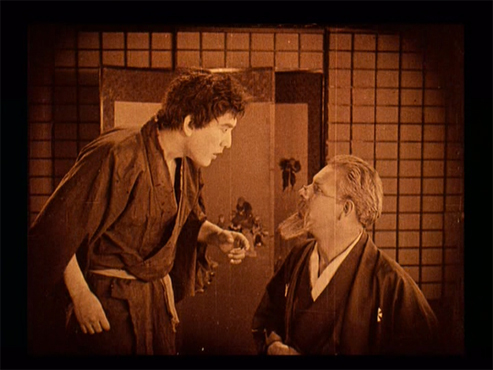 Other silent era SESSUE HAYAKAWA films available on home video.